June 25, 2001 "The Fremont News-Messenger"
Picture: SCOTT BARTLETT has created a 130-pound rubber band ball and a 54-pound masking tape ball. Scott Bartlett's pride and joy weighs 130 pounds, stands two feet high and is 60 inches in circumference. And it's made out of more than 25,000 rubber bands. The 15 year-old started making his rubber band ball in January 2000 after two previous attempts didn't meet his satisfaction. "After about a year of delivering newspapers, I started to get really good with rubber bands," the Ross High School sophomore said. "One day I started to neatly wrap rubber bands around a pop can. But after I was half way done, I got bored." "I needed a bigger challenge." Then he saw a baseball laying on his bedroom floor. "So that day I started to wrap the rubber bands around the baseball," Bartlett said. "I worked hard on it for about the whole day. It was about the size of a softball." Then he decided to start with something smaller for the center of his rubber band ball and found a miniature pool ball. "So I spent all of my time working on my rubber band ball and searching for other rubber band balls," Bartlett said. "I was totally obsessed with rubber band balls, so I made charts and graphs of my progress to my goal -- to get to 70 inches in circumference." When it got to about 12 pounds, he realized his ball wasn't all rubber bands and others he found on the Internet were. So he set his ball aside and started a new one -- this time made completely of rubber bands. "In 2 days, I got the weight up to 3 pounds and just spent all of my time on the ball," Bartlett said. Because regular rubber bands don't fit, Bartlett has to special order rubber bands from companies on the Internet. Rubber bands that will fit his ball cost $2.40 or more a pound. "I'll keep on going, but the cost of rubber bands is a problem," Bartlett said. So far he has spent more than $300 and his dad David Bartlett said his son spends his own money on the hobby. Although getting rubber bands is difficult, Bartlett is not satisfied with his ball. "I'm actually shooting for a world record," Bartlett said. The world's largest rubber band ball weighs 2008 pounds. That ball is 155 inches in circumference , stands 4-and-a-half feet high and cost $6,000 to make. The record is held by John Bain of Delaware. "I have already beaten every rubber band ball on the Internet except for John Bain's rubber band abll," Bartlett said. While waiting for more rubber bands, Bartlett is making a masking tape ball. More than 262 rolls of tape make up the ball that weighs 54 pounds. There is no world record for a masking tape ball, and Scott has not found a larger ball on the Internet. Bartlett, therefore, might unofficially hold the record for that ball, he said. Bartlett's dad chuckled a little when asked his opinion about his son's hobby, but said his son's determination makes him proud. "It keeps him busy and out of trouble," David Bartlett said. Although he has 1,900 pounds to go to beat the world record, Scott Bartlett is confident his rubber band ball will continue to grow. "The spirit of my rubber band ball will never die, and live on masking tape ball," he said. 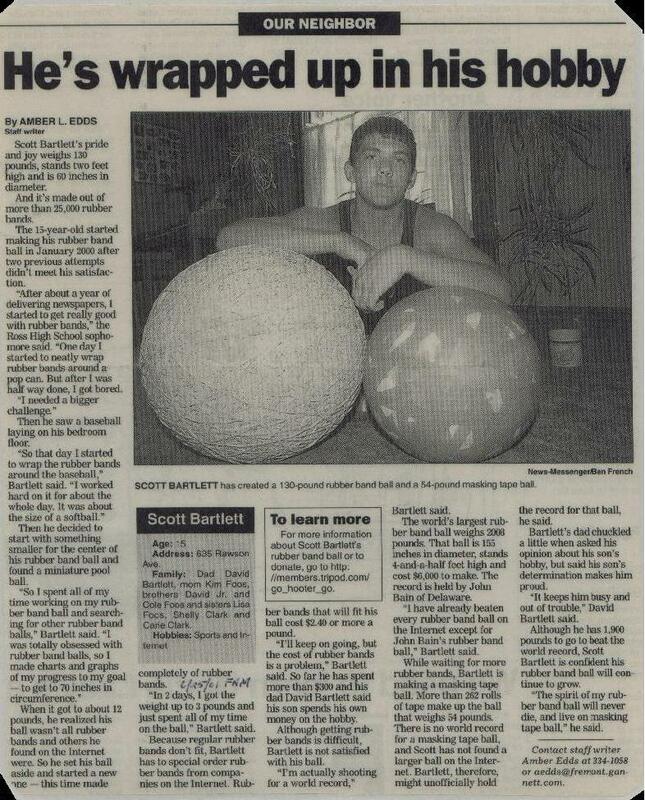 June 30, 2001 "The Fremont News-Messenger"
Scott Bartlett, a Fremont teen whose hobby is making a rubber band ball, is now being challenged for the record by a Flordia boy. Eric Kraff, 12, of Tampa now has a Web site showing his rubber band ball, which is slightly larger than Bartlett's. 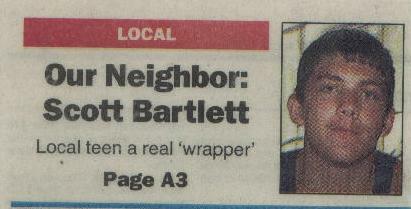 Bartlett and his rubber band ball were featured in an article in Monday's New-Messenger. And the two are now talking about their hobby. "It sort of excites me in a few ways." Bartlett said of Kraff. "Now I am not alone in the race toward teh record. Now I can talk to some one who has nearly the same size rubber band ball, too." Bartlett's ball weighs 130 pounds, is 60 inches in circumference and is made of more than 25,000 rubber bands. Kraff's ball weighs 149 pounds, is 65 inches in circumference and is made of more than 33,000 rubber bands. Bartlett's interest has intensifed since Kraff's Web site opened. "I'll race him toward the end," Bartlett said. "I'm known as the guy with the huge rubber band ball and I am going to live up to that reputation." Picture: Scott Bartlett, 16, sits with his 140-pound ball of rubber bands and a smaller, 98-pound ball of masking tape. The Fremont high school student hopes his creations will be a ticket to fame. Fremont, Ohio - Scott Bartlett isn't the strongest, brainiest or most athletic kid at Ross High School. So how does he get noticed? The 16-year old boy says he has the largest ball of rubber bands in Ohio - 62 inches in circumference and 140 pounds. The almost perfect sphere is too big to carry, so Bartlett rolls it when it has to be moved. "It will bounce, but my mom said I can't do it in the house because it feels like an earthquake," he said. Bartlett has a long way to go to beat the rubber band ball in the Guinness Book of World Records - a 1-ton monster (2,008 pounds, to be exact.) His goal is to reach the 1,000-pound mark, which means he is still 860 pounds and $7,000 worth of rubber bands short. And if he makes it, what does he get besides a Volkswagen-size mass of rubber? Maybe the well-known 15 mintues of fame. (continued) Febuary 25, 2002, "The Plain Dealer"
"I really want to appear with it on the Jay Leno show," he said. "It's something I want to accomplish, something to pass on to my children and their children. I can't see myself ever selling it." Asked if there was a big market for giant rubber band balls, Bartlett said the 2,008-pound record buster sold on eBay for $10,000. He's looking for sponsors, corporate or private, to help him finish. "I can't afford to buy any more rubber bands," he said. "It would be great if a company sponsored me. Then, I could publicize them by wearing their logo on appearances." Bartlett, who has spent more then $300 on the project, started making his rubber band ball on Jan. 7, 2000, using leftover rubber bands from his paper route. He attaches rubber bands end to end and wraps them around the ball to make it grow like a snowball. "It's something I do while I watch television," he said. "For a long time I worked on it four hours a night." Bartlett's dad, david, said he was initially skeptical of the project but has come around. "It keeps him out of trouble," he said. "There are teenagers out there drinking and doing drugs; at least he's doing something. I thought he would get bored with doing it, but he has surprised me by sticking with it this long." Scott's archrival is Eric Kraff of Tampa, Fla.
"His band ball is 375 pounds, and he has already appeared on Letterman," he said. "That's why I want to get mine up to 1,000." When Bartlett gets tired of stringing rubber bands together, he works on his other pet project: making the world's largest ball of masking tape. He said his 98-pound beachball-size mass of tape makes him the unofficial holder of the Guinness record in that category. It's unofficial because he has not yet applied to Guinness, but he was told that his is the largest ball of masking tape in contention for the record because it's the only one. At least, until the word gets out and some bored high school student takes up the challenge.